Many gemstones are fashioned with a series of planar surfaces called facets. The facets on the top or crown of the gem have the function of capturing light, while the facets on the bottom or pavilion reflect light internally. This capturing and reflecting light produces several different illumination effects. In this article we consider the illumination effects of fire and scintillation. In another article we explain brilliance and luster. The term fire refers to the ability of a gem to split light into the colors of the spectrum. The technical term used in gemology for fire is dispersion. The phenomenon of dispersion occurs when different frequencies of light are refracted to a different degree by the refracting medium. The gemstone most famous for its dispersion is diamond, but several colored gems are noted for their impressive dispersion, including sphene, demantoid garnet, sphalerite and zircon. Gemologists measure dispersion with a refractrometer, and the dispersion rating is usually a number that represents the difference between the violet and red refractive indices. But one shouldn't rely entirely on the numerical dispersion rating for predicting how much fire a given gem will exhbibit. Darker gems tend to exhibit less fire than stones of a lighter color, and cleaner stones exhibit more fire than included ones. The term scintillation refers to flashes of light that are produced when a gem is moved in the light. The scintillation effect is a result of the alternating display of reflections from polished facets. The reflections may be white or colored. Very often they are a similar but brighter hue than the body color of the gem. A blue sapphire may flash bright blue, while a red spinel may flash bright red or orange. 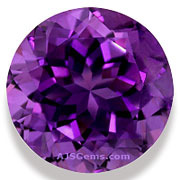 Sometimes these flashes will show a secondary hue, as when an amethyst shows red flashes or a spessartite garnet flashes orange and yellow. In the gem business here in Bangkok we often hear dealers refer to the scintillation effect as "fire." This usage is not really gemologically correct, but one can understand why people use the term. 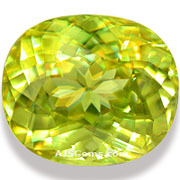 The bright flashes from the facets of a well cut gem do indeed look like fire. But gemologically the term fire is reserved for the splitting of light into the spectral colors, a kind of multi-colored scintillation.